The Drum in partnership with Birmingham City Council is the official organiser of Black History Month 2015. A month long event to celebrate the achievements, contributions and struggles of African, Asian and Caribbean people within the context of their diversity and heritage. Featuring talks, exhibitions, performances, music, tours, discussions, spoken word and fashion. Events during October will include the video projection Crossing Boundaries being shown on the exterior of Watson Building University of Birmingham, Service of Commemoration I live…Because You Lived at Holy Trinity Church, ‘One Many People’ performing a bright fusion of African-Caribbean melodies bringing Reggae, Jazz and Afrobeats together. Further events include the changing face of racism From Racism to Islamophobia and Beyond. A number of our local libraries will be displaying stories of six inspirational black men and women who overcame prejudice The Black Pioneers. There is an opportunity to view the Qur’an Manuscript, among the earliest written textual evidence of the Islamic holy book. BASS 15 Diaspora Britain has the UK’s most exciting poets to respond to works of leading visual artists. 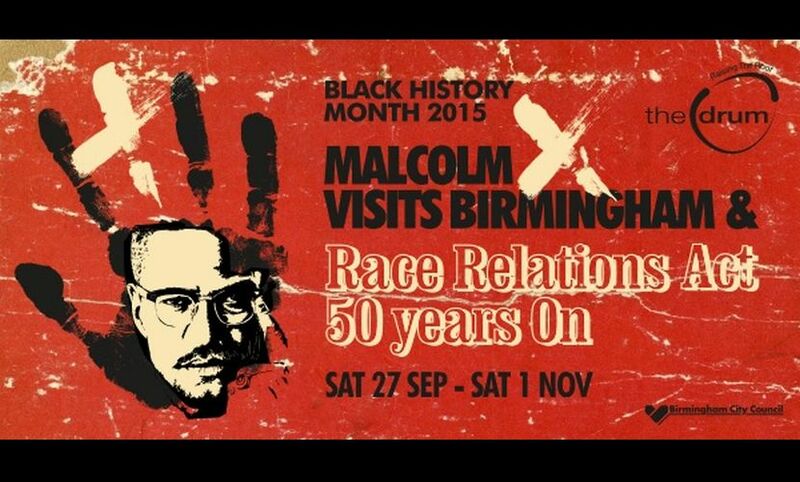 Dr Kehinde Andrews our keynote speaker, will be talking about how Malcolm X’s visit and attitudes to racial discrimination have changed in Birmingham and the rest of the UK since the Act. The Drum has commissioned four photographers Navi Kaur, Jason Daley, Ines Dalal and Imran Arshad to create RACE 50 an exhibition of portraits and audio of members of the community responding to the theme of what they think about race relations 50 years on. Celebrating the Light is a featured performance by young musicians from On The Edge, BlastBeat with turntablism and images by Psykohmantus This will be a collaborative piece developed as part of the Arts Champions Scheme, using the themes of race relations and its impact on diversifying British music over the past 50 years. It will also draw on the persona of Malcolm X as an activist, politician, thinker, his faith and support for black residents on his visit to Smethwick just a few weeks before his assassination. Members of Young Drum (formerly known as YGB) The Drum’s creative learning programme, which offers opportunities for talented young people to take part in creative artistic workshops, will perform a multi-art form piece inspired by Malcolm X. Guests that wish to attend must RSVP using www.bhmbrumlaunch2015.eventbrite.co.uk by 5pm on Wed 30 Sep.